Feldgendarmerie units were generally given occupation duties in territories directly under the control of the Wermacht. Policing areas behind the front lines ranged from straightforward traffic and crowd control to the suppression of partisans, the apprehension of enemy stragglers and the safe conduct of prisoners of war. SS Feldgendarmerie had a severe reputation for being strict enforcers of military law. Nicknamed Kopf Jäger (Head Hunters), they also tracked down and punished those deemed to be deserters. Waffen SS Feldgendarmerie tended to serve with their parent division to maintain order and discipline around their own lines and left other matters to the "Heer" FG. 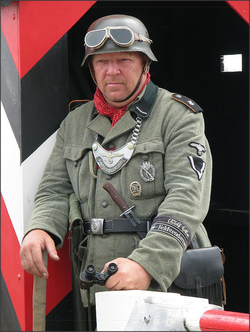 The Kampfgruppe Stahlkrieger FG section also maintain security during public shows, admittance of the public to avoid overcrowding on busy days, marshalling vehicles to and from the battle arena & ensuring all Grenadiers are accounted for when returning from the public battles. Members of the Stahlkrieger FG section have amassed many personal items which contribute towards KSK's award winning displays.